Green beans grown on a trellis. Bush beans, shown above, and pole beans cn be easily gronw and cultivated in western Oregon. Question: What are the differences between pole and bush beans? Answer: Green beans are one of the most popular vegetables for the home garden. Here is a bit of history. Beans are one of the earliest cultivated plants. The oldest findings and proofs that we used beans for food are 9,000 years old and were found in Thailand. Beans were also found in the tombs of the kings of ancient Egypt. The first cultivated beans appeared 4,000 years ago in Mesoamerica and were one of the staple foods of the early peoples. When the first colonists arrived at the New World, Native Americans taught them to grow beans with corn so the bean plants could climb the cornstalks. Beans can be eaten in three different maturing stages, whether they grow on bushes or poles. They are eaten as green beans or snap beans, as shelling beans, that is, when the bean seed has formed but is not yet dried, and finally, as dried beans. Green beans, which are the unripe form of the dried common beans, are divided into two basic types, bush beans (Phaseolus nanus)) and pole beans (P. vulgaris) or climbers. 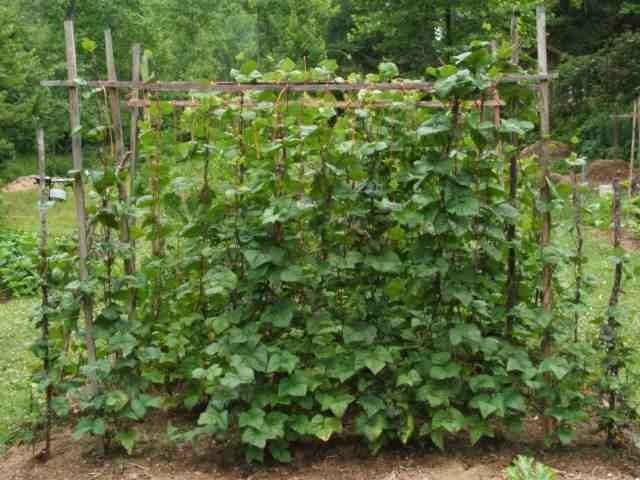 Climbing or pole bean vines can achieve a length of 8 to 10 feet and, therefore, require a strong trellis for support. Bush beans, on the other hand, grow only 15 to 24 inches high and do not need support. Most pole beans varieties require 65 to 70 days from planting to first harvest. Most bush bean varieties require 50 to 60 days from planting to harvest. Bush beans generally reach maturity and produce all of their fruit in a relatively short period of time, then cease to produce. This type of bean is a good choice for gardeners who like to can and freeze, since you will get large harvests all at once. Pole beans, though taking longer to mature, yield more than bush beans because pole beans have quite a long harvest period — about 6-8 weeks. They are also more tolerant of hot temperatures than bush beans. Whether you choose pole or bush type, all beans prefer a slightly acid soil, pH 5.8 to 6.5, with lots of organic material. Beans add nitrogen to the soil. Since they are considered a soil enriching crop they should be rotated yearly. All varieties need full sun. Climbing or pole beans are best located at the north end of the garden, or along a boundary fence. 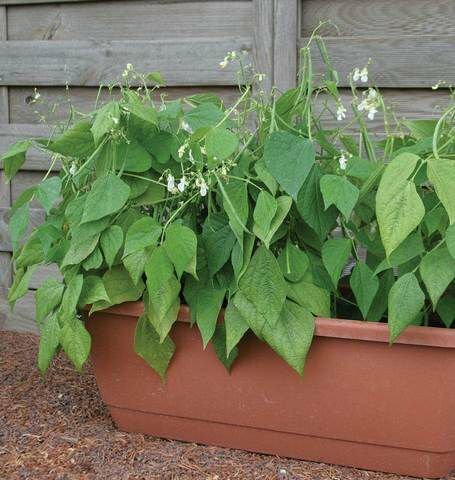 Beans are very tender and can be killed by a slight frost, so it is best to wait until all danger of frost has passed before planting. When planting in soil where legumes have not previously grown, it is advisable to inoculate the seed with a commercial preparation of dried nitrogen-fixing bacteria. All beans are shallow rooted and so require frequent watering during hot, dry periods. To prevent diseases, avoid wetting the foliage. Once your bean plants are ready to flower, apply a 1-2 inch layer of mulch. This will conserve water and reduce weeds. Major insect pests that affect beans are Mexican bean beetles, bean weevils, cucumber beetles and spider mites. Natural controls include birds, tachinid flies and humans who can hand-pick adult beetles off the leaves. For major infestations, spray your plants with an insecticide containing pyrethrins or neem. Beans are subject to a number of bacterial and viral diseases, especially in years of high temperature and high humidity. Treatment of these diseases is not very practical. The best solution is prevention in the form of purchasing disease resistant seed, avoiding cultivation and harvesting when the plants are wet and practicing a program of crop rotation. Blue Lake pole beans brought fame to the Willamette Valley in the 1960s. These beans were developed for canning, but they’re delicious when freshly cooked. Blue Lake can also be found in the bush variety. Kentucky Wonder is a great old-fashioned pole bean, plump and juicy when well grown. Sultan’s Green or Golden Crescent beans are lovely heirloom beans that curve upwards at the tip to form a crescent shape. French filet beans, a type of bush bean, are appreciated for their slender pods that cook quickly. There a several varieties including green, yellow and purple. Romano beans are big, flat pole beans, tender and delicately flavored. They are usually green, but occasionally purple or yellow. These too can be found in bush type. Limas are bush beans that produce short wide green pods that hold just a few beans. Given the choice, which has to do with space and variety, many choose the pole type because of the extended harvest. However, bush beans should be included in every garden because of the ease in growing and the early maturity.